Like all manufacturing processes, your design considerations of your products are made to fit in with the guidelines of that process. This helps getting a clean product without any technical issues. 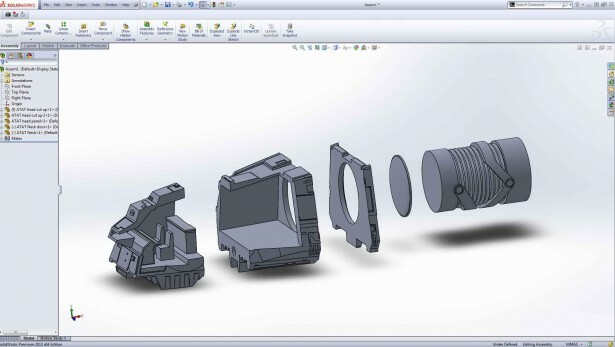 3D printing is now fast becoming more a manufacturing process than a prototyping process, and with this in mind, there are a few simple guidelines to consider while designing for 3D printing. My name is Kirby Downey. 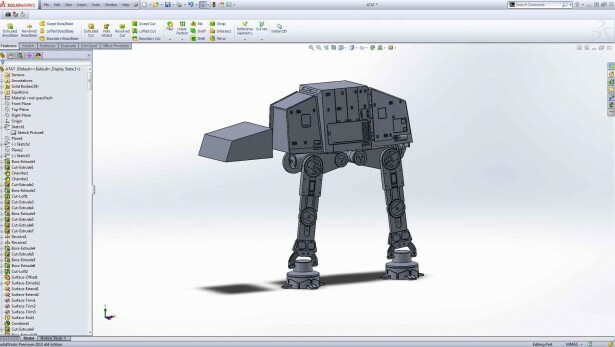 I’m a professional 3D designer, and an expert in designing for 3D printing. I specialize in prop recreation, replica models and mechanical designs. 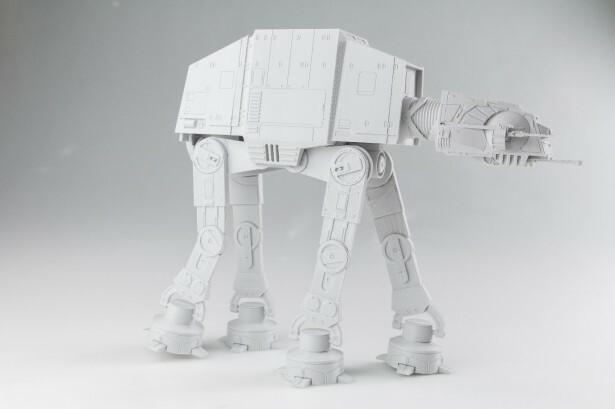 I will use the model of an Imperial AT-AT walker from Star Wars I modeled because, well, because it’s awesome! 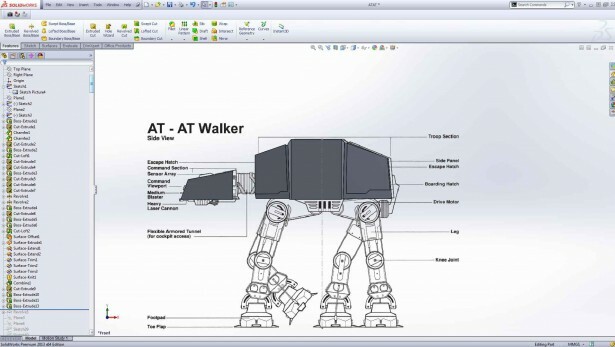 And it can show you the considerations that are needed when designing for 3D printing. 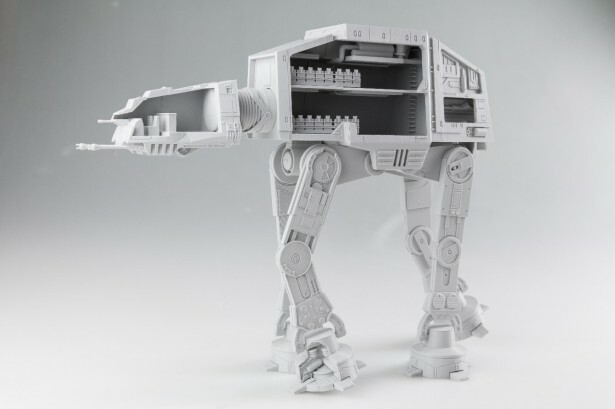 This Model consists of 34 parts, has 12 points of articulation, and is designed to be as easy to print as possible. Before I get all carried away with this, let’s start by outlining the Design Considerations needed to design for 3D printing. 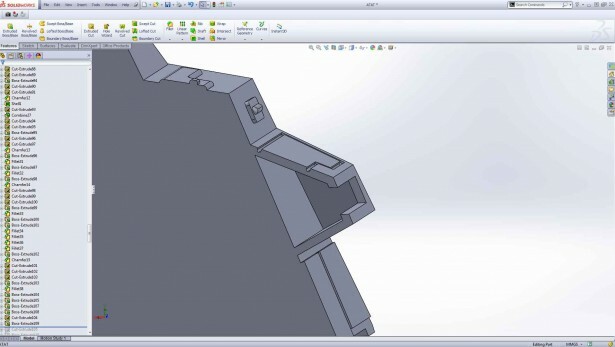 There are four basic considerations: Size, Orientation, Support free design, and Tolerance. The first and most important is size. 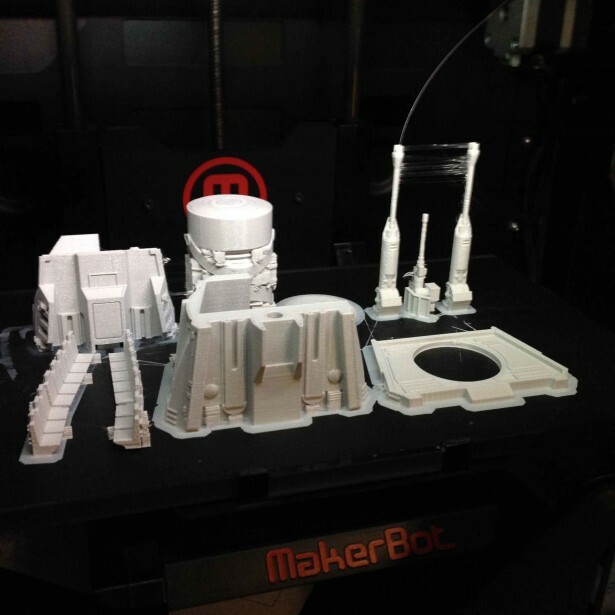 Your biggest limitation with 3D printing is size. 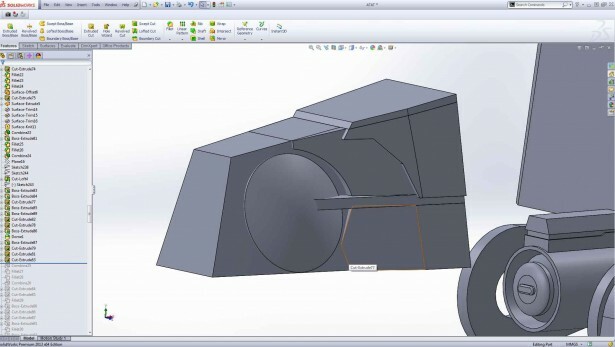 Now this won’t restrict the size of your final model – you can cut that up into smaller pieces, but the size of your machine can limit the size of each piece. So the smaller your machine, the more pieces needed to complete your model. Remember the size of the machine you going to print on. This will allow you to judge scale and plan your cuts beforehand so you can design around those cuts. The second consideration to keep in mind is orientation. 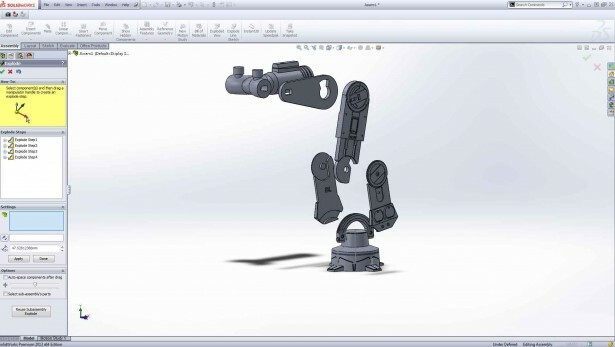 This can help your model be structurally strong, support free, or even allow the details to show better. When printing you always want the largest surface area to be on the bed. The smaller the surface area the higher, the chance that the model will come off the print bed causing the print to fail. This can be frustrating as it’s a material waste and more importantly a time waste. Nothing more annoying than having a 12 hour print fail with an hour left to go because of orientation. Orientation can also affect support material as you can’t print on nothing. You need a structure to build on. 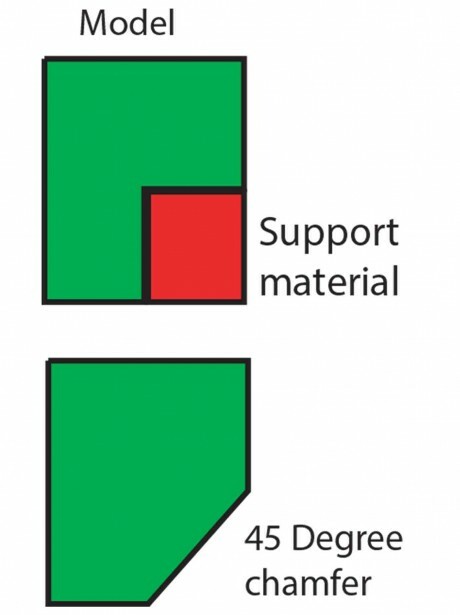 Over hangs need support, but changing the orientations will remove support. The best example is this rod. 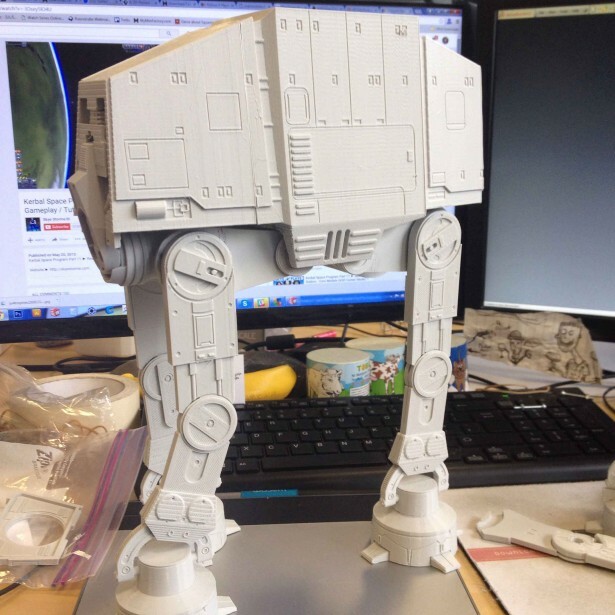 If you print it upright, it can be snapped easier due to the layer adhesion. But print it on its side, and it’s structurally strong and cannot be snapped easily. Thirdly, we shall look at Support free design. Support can be a designer’s best friend or worst nightmare. It helps your machine perform those great shapes, but can scar the surface. Some supports peel off but others are near impossible to remove. 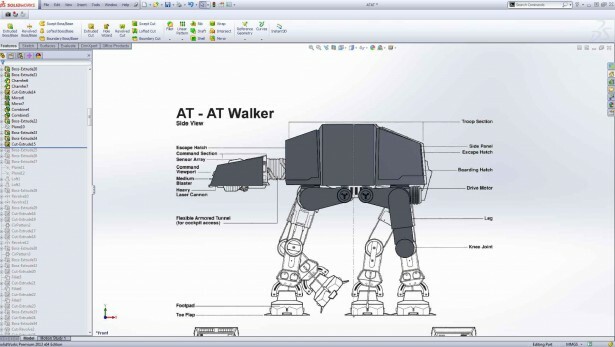 The best thing you can is design you model to print without support or with the least amount of support material. Now there are simple ways to have none to little support on you model if orientation doesn’t help. The first way is to add 45 degree chamfers. Anything 45 degrees or higher to the build plate will print support free. Any chamfer less will require support. With over hangs, debosses and embosses you can get away with a 0.5mm extrude or cut. The machine will not put support on this. This can allow you to add a lot of detail and writing where no support will be used. Nothing is worse than removing tiny bits of support from these tiny details. Finally, the last consideration is tolerance. 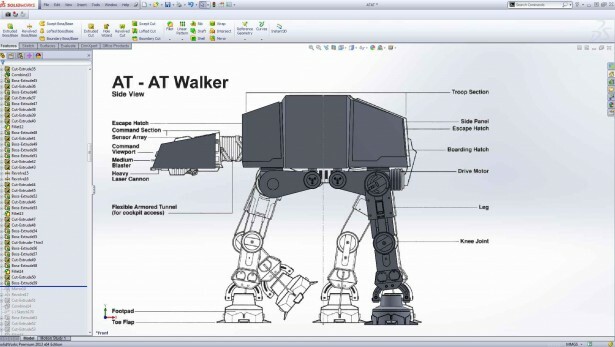 Now this is only a consideration if you wish to create moving parts and parts that fit into each other. The main rule I use is if you wish to have a tight fitting joint. Use a tolerance of 0.3mm between the two bodies. For loser, free moving fits use a tolerance of 0.5mm between the two bodies. This will allow your parts to move freely for joints or lids. Now this may seem like a lot of information to take in. 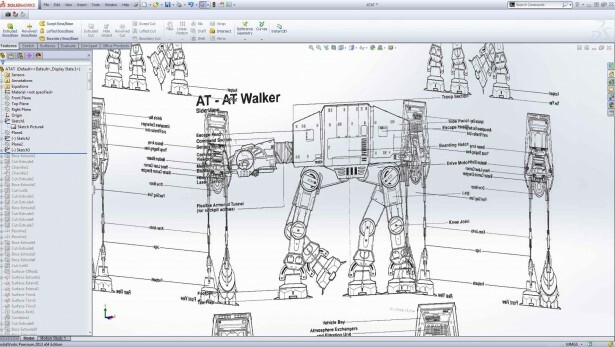 Let me ease you into it by taking you through my design process of my AT-AT so you can see where I made the necessary design considerations in this model to make it the best 3D printable model I could make. To start my model I got some reference images together. This allowed me to get a good idea of what’s ahead. I found a very good blue print which will allow me get an orthographic view of both the front, left and back views. Placing those with a scale, I positioned them with some extra planes to help me get an idea of where I was building. Then you start modelling. I chose to start on the body as this was the largest and I knew I might need some time with the different faces at different angles. Once I was happy with the basic body, note I kept them as three separate bodies, I began on the under charge and moved down the leg. I used the back left leg as it was the straightest leg. I worked down the leg, adding more and more detail as I went. Remembering that the details should protrude more than 0.5mm from the body it’s attached to, I only modeled one leg as I planned to mirror the leg around to the other three joints to save time. When I got to each joint, I kept in mind that I wanted them to move so I kept a tolerance gap of 0.5mm between the bodies. I didn’t go too far with the joint yet as my focus now was to make the whole body, then focus on the joints. Once the whole leg was complete I started on the body again. Starting from the back, I moved toward the front, adding in all the little details. This was challenging as the faces were not flat. I had to use a lot of surface work here, which I’m still fairly new to. Doing this helped me learn more about surface modelling. Once the body was complete the only thing left to do was the head. The head was challenging due to the shapes and detail. I noticed the head is symmetric, so I decided to only model half of it. I find being lazy will always find the easy way to do something! I had the basic shape and I added a few more bodies which weren’t combined. I shaped them to make the general shape needed. (Yes, it’s a lot of shapes but bear with me.) I then combined all the bodies to make it one. With time, more and more detail was added making it look better and better. When I moved onto the smaller details, which the head had the most of, I made sure no parts were thinner than 1.5 mm, as this can cause a problem with the printing process. This does detract slightly from what some details really should look like, but better to have a successful print than a bad one. As I knew I was going to hollow out the body and make a detailed section view, I shelled the head before mirroring it so I could add the interior detail. Once I was happy with all the detail, I mirrored the head and quickly added the non-symmetric details. While I worked on the details of the neck, I remembered to include a 0.3mm tolerance as I wanted the head to be a tight fit to the neck. Just means less glue is needed. Now the body is completed. Close to 2,500 features later, I focused on adding the internal detail to the main body. I began separating all the individual bodies into their own files as for now I was only in a single part. This allowed me to build an assembly and get a feel for how I was going to assemble this, as well as some areas where I needed to make changes. I opened the body part and begun adding in the piping, the lighting, the doorways, the speeders and the seats. I didn’t focus too much detail on the interiors as I want the eye to focus on the exterior detail. Once all the detail was complete I began working out how I’m going to cut this so it can fit in the printer and be printed with little to no support. The legs were the easy part. Only part which needed cutting was the lower leg or shin. This had to split in half to allow it to clamp around the knee joins and the ankle joint. A drop of glue in the middle would hold it all in place and move freely. This will also give the shins a flat back to print on support free. 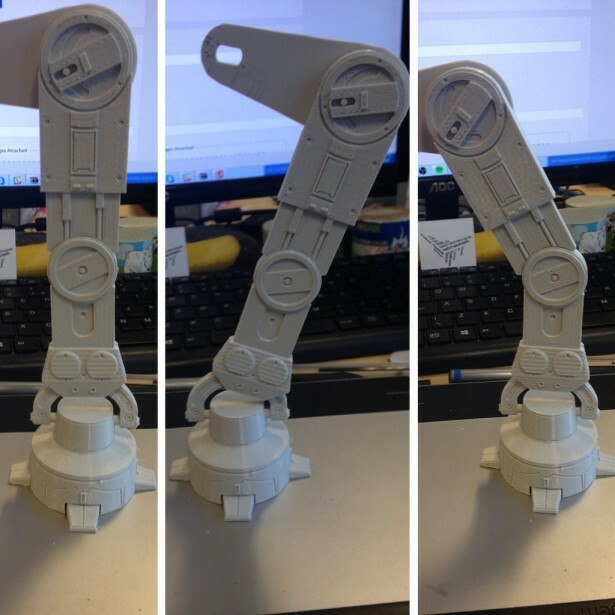 The upper leg or thighs had detail on the back and front so I orientated it to print on the side. 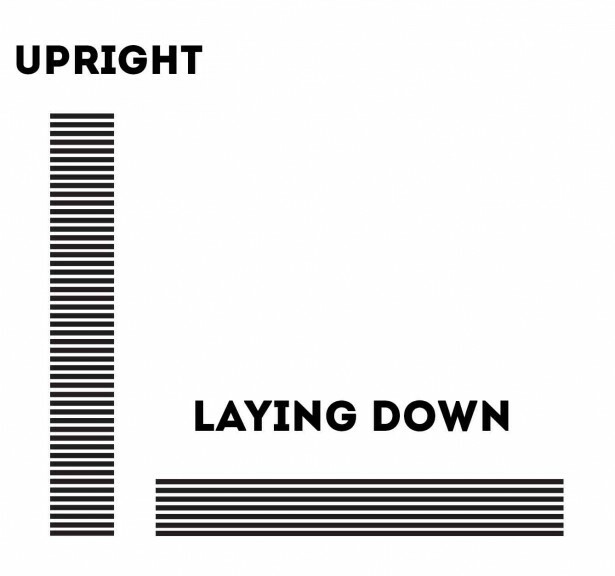 This is a good example of how orientation can affect your details. I finished the legs by putting a pin joint for the hips and the legs and also placed markings where the legs needed to be placed and which parts it should be paired with. For example, the back left leg parts had the initial BL. 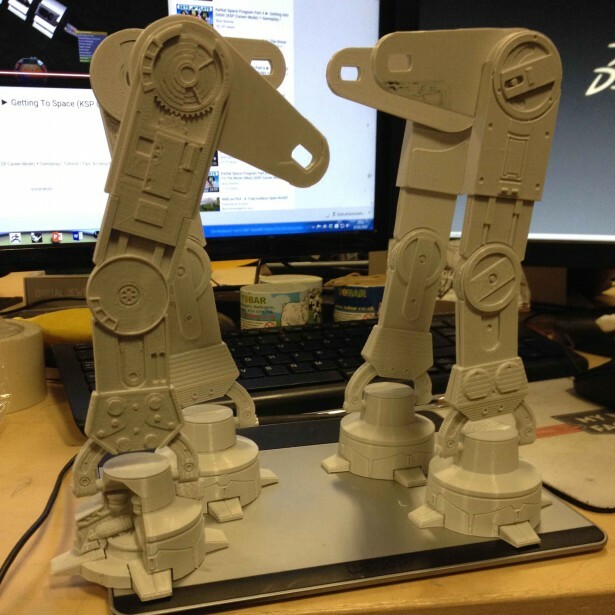 This completed the legs and they were ready to print. The body was separated into 4 parts. Three parts for the main body and one for a panel. I cut them up so I could orientate them as seen in the image. I also made a 5.5mm hole through so I could slide a M5 threaded rod in it. I did this to both to align the parts while gluing and add some strength. I also removed the Seats to print separately as printing them in place would be nightmare for support. I also added groove joint to help align them correctly. The neck was split into 2 parts, just to allow it to be printed on a flat surface. The head was split into 3. In the image, you can see I added a hole for a rod similar to in the body. Again, this helps with alignment and strength. Everything was now ready to print. As I have done this so many times, I had no problems with printing and nothing had to be redesigned. This type of knowledge can only really be obtained by practice. But following these guidelines will help you avoid a lot of basic problems and strain right off the bat. 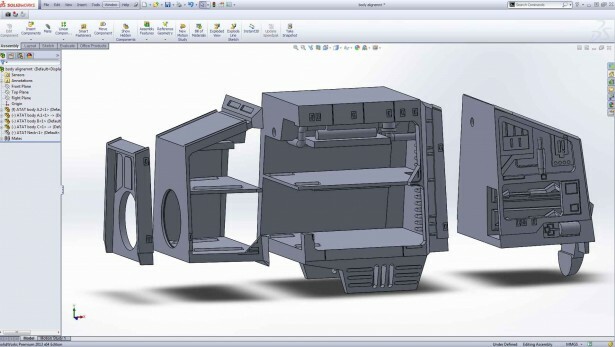 One of the reasons why I enjoy using SOLIDWORKS so much is when it comes to assembly. 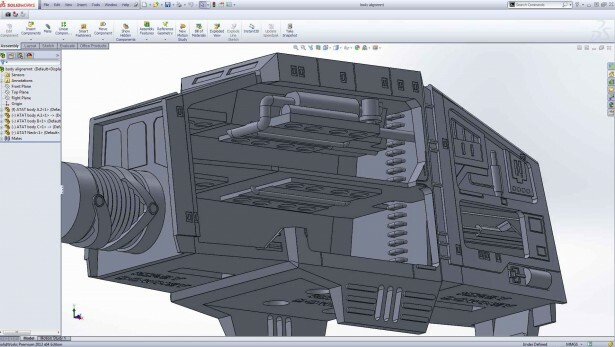 Because I have assembled it in SOLIDWORKS, and tested all the joints and mechanical moving parts, I knew what direction I needed to go in terms of building. Coupled with the precision dimensioning and the precision of the machine, all the parts fit and worked first go. There is no need for filing or reprinting. It just works. 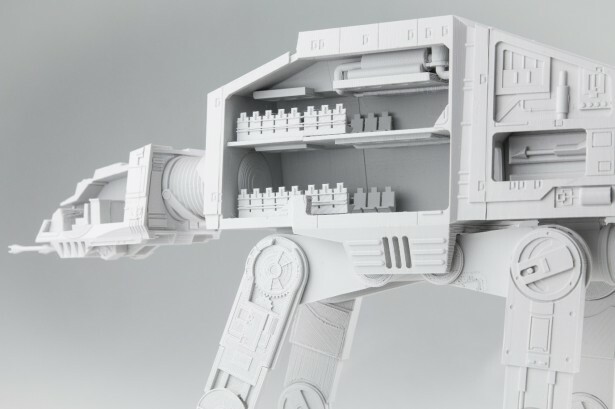 As long as you keep these basic rules in the back of your mind while planning your build, along with making the model, you can easily make easy to print, successful objects straight out of your printer. It does take practice, but using these guidelines you are a step above everyone else. And remember, don’t say you have failed, unless you have tried to succeed in the first place. 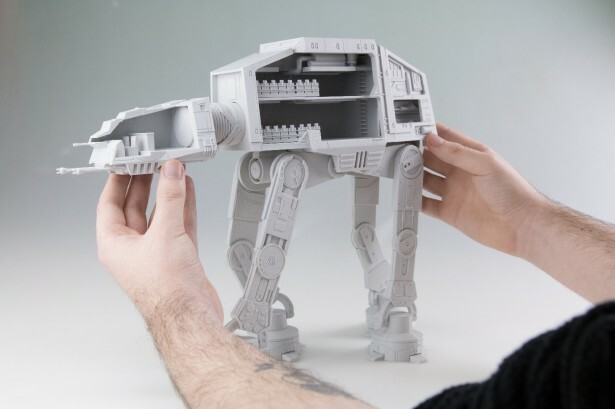 For a full video of me assembling the AT-AT follow this link. To download the files follow this link.